There’s so much to remember when onboarding a brand new member of staff. From creating user accounts and setting up a workstation to adding them to your payroll and taking them on the health and safety tour, you have enough to focus on during induction without having to worry about covering policies and procedures, too. Behold, the employee handbook. One resource to rule them all… Sorry – bad Lord of the Rings pun. Although, maybe not too far from the truth since it covers all of the above and then some. An employee handbook (also known as an employee manual or company policy manual) is a three-part document (or, if you want, three different documents) that help you provide your employees with all of the information that they need to do their jobs and to know their benefits and rights. A policy manual: putting all company policies in one easily available place, ensuring that staff know what is required of them and the rules they need to abide by. A procedure manual: helping to train new employees and current staff how to do their jobs and understand company procedures. A benefits description: including pay, time off and other benefits of work. What Makes a Good Handbook? 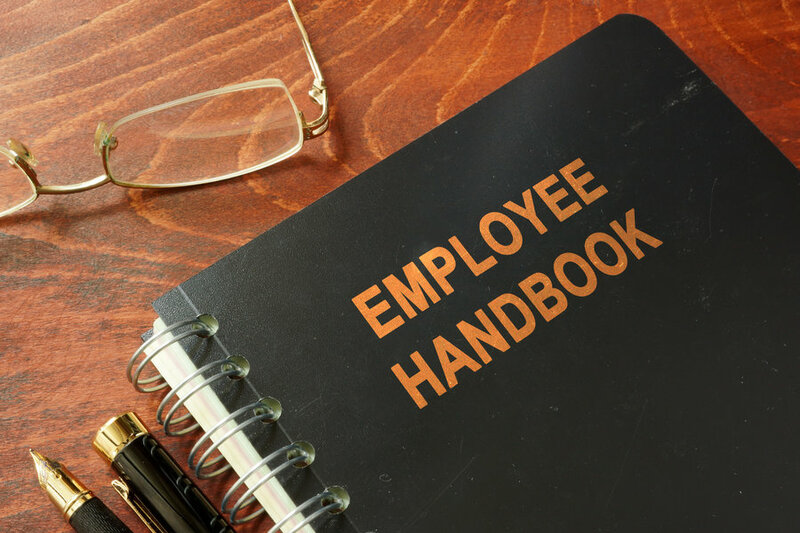 The purpose of an employee handbook is to keep everyone up-to-date and on the same page on what is required of them. This is especially important when hiring new starters because you want them to get off on the right foot. A good handbook protects you from liability. You’ve basically given your staff everything they could ever want or need to know about the company, what’s expected of them and all company policies in one handy little book full of all the answers. As long as your handbook covers everything required of it, there’s nothing stopping you from downloading a template to populate and roll out to your staff; but if you want to create an employee handbook that your staff will actually want to read, you should think about going the extra mile to ensure that your employees are hooked from the get-go. ‘Employee Handbook’ just sounds so boring. It’s difficult to properly engage in something when you’ve already conditioned your mind to believe that your new reading material is going to be dull. Go for something a little more exciting like ‘Team Guide’ or ‘Our How-To Book of Answers’. Finding something that fits in with your company culture is the best way to draw your staff in. Have you ever stopped to think about why your staff come to work for you every day instead of some other company? By adopting a mission, you show both your workforce and your client base what you stand for and how your company culture works. More to the point, it helps to engage your staff in the work that they do and the environment that they help to maintain. Start your handbook with your mission – and make it a good one. This will set the framework for your policies and procedures, conveying the expectations you have for your staff and company alike. It’s easy to find generic policy templates to copy into your handbook, but your company policies can be so much more than just a set of rules for your staff to abide by. Where better to endorse your culture and values than in the very first document that your staff are going to read? Explain your policies and the reasons behind them, but keep the language consistent with the way you would speak to your staff in person. A good example would be to articulate the image that your company seeks to present internally and to clients within your dress code policy, while your benefits policy could illustrate how important it is for your employees to have a good work/life balance. The benefits that you offer to your staff speak a lot about how much you value them and want to ensure that they are looked after under your employment. If you have invested in building perks and opportunities for your staff, make sure to show them off right at the front of everything that your handbook is about. The rest of the handbook will talk about what is expected of your staff, so it stands to reason that you should show them how you intend to invest in them in return. The likelihood of your employee handbook being lost in the ether is pretty high if you expect to simply email the document around to all staff. Think outside the box. Be creative. Be bold. Make your handbook as pleasing to the eye as possible but do so in paper form. You could even bring it to life with a survey that allows your staff to give feedback on the document, including their thoughts on your policies and producers or any changes that they would like to see made. The more care and effort you invest into your employee handbook, the more you will demonstrate that your policies & procedures and your culture and mission are all equally as important and at the heart of what you do. Now that you’ve got an idea of what constitutes a good handbook, it’s time to get writing. Step 1 – Set the Stage: Since you’ll be starting with your company mission, give a bit of background about your company including its history and values. Be sure to write your handbook in a fluid and understandable way and include any examples or stories that you feel are relevant and engaging. You want people to quickly understand what they’re reading and to encourage them to feel proud of being a part of the company’s culture, story and growth. Step 2 – Lay out the Basics: Explain what your staff can expect from you and what you expect from them in return. Make sure to do your research into the policies that you are expected to have in place as these will all need to be included in your handbook. Step 3 – Add the bits your Staff Care About: Once you’ve outlined your policies and procedures, address other areas of importance including holiday and flexible working policies, parking, mobile phone usage, dress code and anything else that is important and relevant to your team. Step 4 – Get Sign-Off: Once you have a completed draft of your employee handbook, run it passed HR for approval. At the point that you have a final copy of your handbook, it’s time to roll the document out to your team and any new starters that join you thereafter. Remember to include an acknowledgement form at the back of the handbook for your staff to sign, signalling that they understand your policies and what is expected of them. Step 5 – Keep it Up-to-Date: Employment laws change frequently and you’re policies will need reviewing on an annual basis, so it’s important that your handbook is kept up-to-date and addresses all new laws and company policies and procedures. Needless to say, if you do need to make any amendments, you will need to provide your staff with a new copy and ask them to return a new acknowledgement form too.